Yesterday, I told you all about what I was up to 25 years ago around this time, June 7th weekend. It's hard to believe 1985 was that long ago. Before you can brag, I know many of you dear readers weren't even born yet, whatever for you. "This is my dream my wish, but it didn't come true..." sorry not sure how that slipped in there. Anyway, Cyndi Lauper was awesome. No doubt about it. Born in New York City, Ozone Park Queens (my mom was also born in Ozone Park, lived there until she was 4 and taught there for 20 years by the way!) ... Cyndi was a true New Yawker, she tawked just like me and had such great style. From "She Bop" to "Time After Time" to "True Colors" -- I loved Cyndi's songs. She truly was the funkiest pop singer back in the 1980s. She still performs live and has a 2010 album out, though true to my 1980s ways--I prefer her old hits. Steven Spielberg himself asked Cyndi Lauper to be the music director for The Goonies. She was given the freedom to select her favorite performers for the soundtrack - one of which was The Bangles. Cyndi's role as music director had her working 12-hour-days. Sadly, during her time on the set of The Goonies, she suffered gynecological problems which required surgery and a hospital stay. "The Goonies 'R' Good Enough" won Cyndi Lauper a Grammy nomination for Best Female Pop Vocal Performance. "The Goonies 'R' Good Enough" video was released in two parts on MTV. One before the film's release as a tease to create a buzz of course and the second part after the film hit theaters to continue the Goonies excitement. Cyndi's mom appears in most of her videos, including "The Goonies 'R' Good Enough"--can you identify her? Back then wrestling was all the rage, Cyndi got some of her closest wrestling friends to star in the video--can you spot them? Cyndi Lauper & The Goonies in "Goonies 'R' Good Enough"
That's one of my favorite movies of all time! Love the Goonies! She Bop is my favorite song by Cyndi! That was long! (at least it let me watch it this time) Loved Cyndi! One night at my parents place they put on their Cyndi Lauper DVD and I caught some of it. I so remember her music. I watched her videos many a times in the middle of the night while feeding a hungry baby. I loved time after time the best. I bought the Goonies on dvd for my daughter for Christmas, she was singing that sone for 3 days! any thoughts about her on the recent celebrity apprentice? Back in the day when Goonies came out, a BF took me to the Drive-In to see it, but being the jerk he was, HE didn't like the movie, so decided we should leave. BF didn't last, but the Drive-In theater did. Yea!! I love the Goonies! I used to watch it all the time growing up. I think this should be our movie for next weekend with the kids! Great video(s). I actually saw Cyndi's mom too on celeb apprentice this year. yes i watched the show, and somewhat liked it. Oh my gosh! She was so young back then!!!! I just finished watching her on Celebrity Apprentice and it was fun to see her. Cyndi was, is, and will always be my idol. Her voice, her clothes, her hair... her fame... all from a NY girl. Sally's Pigeons is one of my favorite songs of all time. also, I've been watching Goonies all weekend long. I'm only 27 but I grew up with brothers who were 15/16 when I was born so I'm really an 80's kid at heart. OMG Your whole blog takes me back! I've always been a big Cyndi fan! She is still as cool as ever!! Here from Twitter..Thx for the follow! Love Goonies!! LOve Cindi!!!... i have to get my boys into it!!!!! I didn't know that she was actually the music director for that film! Did not know she was the music director....fantastic! Love it. 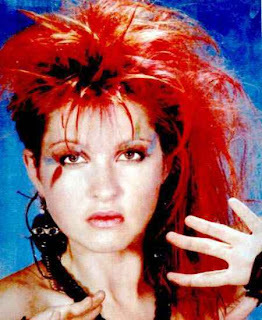 I love Cyndi Lauper. Me and my dad always sing time after time together. She was pretty cool. Sadly I am one of those readers who happen to not have been born yet. lol. '89! I have never seen this longer version of the video before…love The Goonies! Also, CL was quite the oddity back then, of course, that's what made me love her, too.